You know you’re famous when your face appears on the side of a bus. That’s what happened to the legendary film diarist Jonas Mekas when the Visual Arts Center that bears his name opened last November in Vilnius, the capital of Lithuania, Mekas’ home country. The bus in the photo above is promoting that opening and the picture was taken by Robert A. Haller, who also kept a diary of the festivities, which was recently published at the Brooklyn Rail site. (Story found via GreenCine Daily, ‘natch.) Haller is the Director of Collections and Special Projects at Anthology Film Archives, which Mekas of course co-founded in 1970. I kinda wish the article was accompanied by more photographs, but it’s nice to read about Mekas getting feted by an international group of diplomats and to know that Lithuania is treating him like a favored son. Even the Prime Minister of Lithuania, Gediminas Kirkilas, showed up for the event. Devoted to avant-garde art from all disciplines from the twentieth and twenty-first centuries, the Center hopes to lead Vilnius into becoming a major European cultural art center by 2009. If you go to the Center’s official site right now, you can watch a half-dozen of Mekas’ films. (If you can’t figure out — and I couldn’t at first — you have to use the bottom scroll bar and go from left to right.) There’s a great short on there that Mekas shot of himself editing his feature As I Was Moving Ahead Occasionally I Saw Brief Glimpses of Beauty to the accompaniment of Beethoven’s Kreutzer Sonata. Other films feature famous folks like Salvador Dali, Jacqueline Onassis, John Lennon and Andy Warhol. This leads me to a rant. Two rants, really. Rant, the First: Back when I was obsessed with Andy Warhol (early ’90s-ish) and I read at least a dozen biographies of the guy, if not more, I now feel like none of them ever mentioned his relationship with Mekas. It may be possible that since I wasn’t all that familiar with avant-garde film at the time, I skimmed Mekas’ name in those books and it never registered with me. But that just doesn’t seem likely since when I typically come across unfamiliar names and such associated with a subject I’m interested in, I tend to go out and find out more about those names. I still have a bunch of those Warhol biographies and I’m going to look and see if Mekas pops up in any of them. If it does, I’ll come back here and recant my rant. If it doesn’t, then every time I look up Mekas films online and I see all these diary pieces about Warhol, I’m going to continue to be irritated. OK, RECANT BELOW. Rant, the Second: Is there any other avant-garde filmmaker other than Mekas who has so embraced the personal digital distribution of films? Seriously, I want to know if there is because whenever I read some article online about video iPods it’s of the “OMG, the cinema is melting! People are watching movies on iPods!” variety. Yet, if you go to Mekas’ official site there are a ton of short films you can download and watch on your iPod. Usually when new technology pops up, it’s the artists who come in and try to figure out new ways to use it to their advantage, e.g. the introduction of 8mm film and affordable video cameras. When it comes to iPods, though, it seems that most people freak out and say it’s the end of film. But what other real avant-garde filmmakers out there — in addition to Mekas — are using the iPod as a new way of transmitting art? Really, I don’t know of any, but would like to. 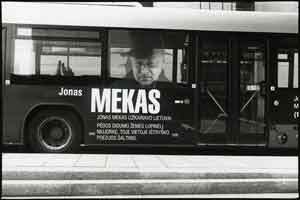 I have a video iPod, and although I have yet to download Mekas’ films, I do watch movies on it and enjoy it. I gotta get some of his now. RECANT of Rant, the First, in which I eat some crow. I looked in two Warhol biographies I have. The first was Holy Terror by Bob Colacello, which mentions Mekas twice. Once is Mekas’ reaction to the first issue of inter/VIEW magazine and the other Colacello writes about watching Warhol’s films at the Anthology Film Archives with Mekas for research. The other biography is The Life and Death of Andy Warhol by Victor Bockris, in which Mekas is mentioned 10 times, according to the index. The mentions include Mekas being present at the filming of Empire — which I think Mekas also covers in his Movie Journal — as well as when Mekas awarded Warhol Film Culture’s Sixth Independent Film Award for Sleep, Haircut, Eat, Kiss and Empire. And if you go to the Visual Arts Center site, you can watch the presentation of the award over which Mekas says something along the lines of “Andy Warhol was the one friend who never let me down.” So, I’m glad that their relationship has been documented in Warhol’s biographies and that I’m just an idiot for not remembering.